While many leaders like Andy Grove of Intel, Ben Horowitz of A16Z, and Yelp CEO Jeremy Stoppelman swear by one on one meetings, there are many managers and leaders that doubt their importance and choose not to have them. A big part of this doubt is often due to bad experiences they’ve had with one on one meetings themselves. Like any good idea, it takes work to make them successful, and one on one meetings are no different. As I’ve spoken with hundreds of leaders and managers as we’ve developed Lighthouse, I’ve heard a series of misconceptions, or myths, contributing to people failing to have good one on one meetings. To help you (or a friend) reconsider the value of one on one meetings, here’s 10 myths that we’ve heard and the reality of each of these busted myths. Myth #1: One on one meetings are a waste of time. You don’t feel like you have anything to talk about. Team members don’t bring anything to discuss often enough. You believe your team is mature enough to not need them. You don’t think you have time for them. Reality: If you do one on one meetings well, both you and your team members will look forward to them and it will have a strong, positive impact on your team. Myth #2: Experienced team members don’t need one on one meetings. While younger, less experienced members of your team may need more attention and coaching, it’s a mistake to think that your more experienced people don’t need any. One on one meetings are a crucial part of communication in your company and play a key role in giving every one of your team members a voice and the help they need. One on one meetings are more than just a time to hear complaints or deal with interpersonal issues on your team. They’re also an opportunity to talk about growth, feedback, and ideas, all in a safe, private setting. Why deny that from the veterans on your team? Reality: No matter a person’s age, they still have goals, feedback, and ideas that are best discussed in one on one meetings. Myth #3: An Open Door Policy has the same effect as one on one meetings. It’s intimidating: To come and interrupt their boss, there’s a aura of grave importance needed to interrupt you. You may not always be there: What if they have a problem and you’re busy, in a meeting, or otherwise not there? They don’t know when it’s open: How do they know if they can’t see your office from their desk or they’re a remote worker? Just because you’re at your desk, is it a good time? Reality: An open door policy is helpful, but does not provide the same opportunity for regular, structured discussions about what’s important to them like a one on one meeting does. If they know there’s a low pressure meeting every week or two to talk about issues, they’re much more likely to bring them to you. Myth #4: Checking in at review time is plenty. If annual or bi-annual reviews are sufficient, then that’s all you need for the kinds of discussions you have in one on one meetings, right? Not really. Even once a month is not enough. There’s so much you can talk about that you’re leaving a lot of value and opportunity to learn and fix problems on the table by not having them regularly (i.e.- weekly or bi-weekly). You’re also letting issues grow too big before you’re even aware of them, let alone fixing them. How can you hope to fix problems when they’re small if you only talk about them a few times a year? When a problem goes unchecked, it leads to irreparable damages like team members quitting, firings being necessary, and morale plummeting. Reality: Have your one on one meetings weekly or biweekly to ensure no problem grows too big before discussing, and to help you make regular progress on what matters most to your team. Myth #5: You should talk about the same thing in every one on one meeting. As you can see, there’s a lot of ways to talk about things important to your team. Reality: Mix up the questions you ask to ensure there’s no elephants in the room and you take full advantage of the candor and relationship building of one on one meetings. Myth #6: You should not take notes in one on one meetings. One on one meetings can be a casual, more laid-back meeting. Some managers have them over lunches, taking walks, or even over beers. However, that casual nature should not downplay the importance of what’s discussed. When a team member brings up an issue in a one on one meeting, it’s clearly important to them. You need to do something about it and help them feel like you’re working together to make incremental progress on the issue. The best thing you can do is start by writing it down. If you don’t write anything down, you’re unlikely to remember what was discussed next time, nor take any action on what was discussed. Both of those are cardinal sins for one on one meetings as your team member will lose confidence in you doing anything about what they bring up. If that happens, they’ll stop bringing issues to you and morale will plummet. Reality: Writing down what they tell you is crucial to ensuring you do something about what they bring up and remember what was discussed in your last one on one meeting with them. If they bring it up in a one on one meeting, it’s important to them and they will usually want you to remember it. Myth #7: All you need to do is show up to a one on one meeting and listen. Now, you know from Myth #6 you need to take notes, and you can see from Myth #5, there’s a lot of questions you can ask. Doing both of those things will help a lot to improve the quality of your one on one meetings, but listening actively is then still not enough. Great one on one meetings challenge your team members. They may bring good things to discuss, and as a manager you need to take it a step further. From Andy Grove’s Principle of Didactic Management: “Ask one more question! What can each of us do to make progress on what we talked about today? Reality: Be an active listener, and also challenge your team members to really understand a problem and potential solutions. End your meeting by setting action items so the discussion leads to progress. Myth #8: It’s okay to cancel one on one meetings, my team even says so. When you have one on one meetings regularly, you build confidence in your team that they have a consistent time they can talk to you about ideas, feedback, and problems. When you break that rhythm by canceling their one on one meetings, you disrupt their ability to have regular, open communication with you. If you ask to cancel, they’ll usually say it’s okay, because you have a power imbalance over them; they want to please you and help you out. If you’re asking to cancel, they’ll assume it’s for something more important than them, but they will then resent you since now something else matters more than the one on one meeting that’s for them (i.e.- they don’t matter to you). As you can see from above, there are plenty of things to talk about in one on one meetings, so don’t miss out on those discussions by canceling. Your team will be less motivated to bring things to their one on one meeting if they’re not sure it’s going to happen and will question how you value their input if you cancel because something is more pressing. A manager has only a few tools in her arsenal to do these, and 1-1’s are perhaps the most powerful. Reality: Never cancel one on one meetings. If you can’t meet at your scheduled time, reschedule. Only holidays and vacations should lead to canceled one on one meetings. Myth #9: If one on one meetings failed before, you can’t try again. 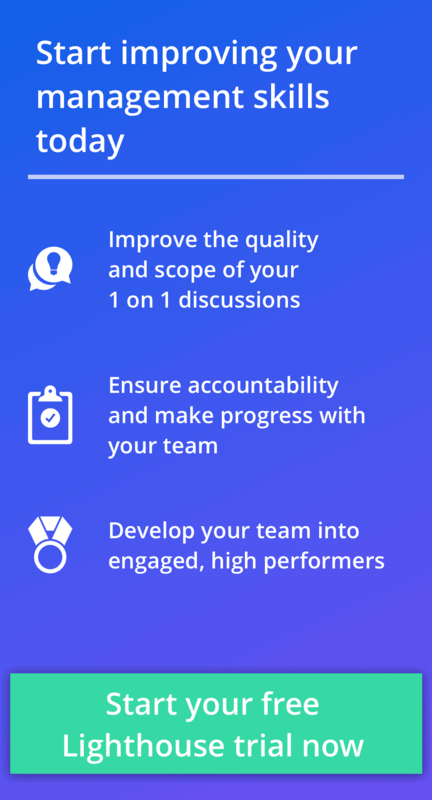 If no one ever told you how to have great one on one meetings and your past managers didn’t set a great example, there’s a pretty good chance your team didn’t like your one on one meetings. You may have tried and eventually just given up on them. That’s a shame. While there may be some scars or resentment from past, ineffective one on one meetings, don’t let that stop you from getting it right the second time. Tell them why you want to try them again and what will be different this time. Even if your team is skeptical, a few great one on one meetings will change anyone’s mind. Reality: If you set your team’s expectations and learn from what made them fail, you can always try them again. The resulting payoff is worth it. Myth #10: Good one on one meetings are easy from the first one. The first time you have a one on one meeting with a team member is going to be awkward. Often, like a first date level awkward. Don’t let that stop you. Earlier in my career, I was managing a remote team member who prided himself in efficiency. For one thing, he hated meetings, so he was really skeptical about the value of one on one meetings. Compounding things, I didn’t know him very well since he was remote. I picked out some good one on one meeting questions for us to discuss each week, and while the first was a pretty awkward chat, by the third one on one, it was something we both looked forward to. It wasn’t long before I was getting all kinds of interesting insights from him and his productivity and morale was boosted. We also were working better together than ever before. “The team appears to be more energized and I’m finding myself more confident in leading each individual. Reality: The first time you ask some of the good questions of a one on one meeting can be awkward. Push through it and you’ll find each one gets better as you follow up and follow through on what you discuss. Soon enough, you’ll then both be looking forward to them and seeing the major ROI of one on ones. 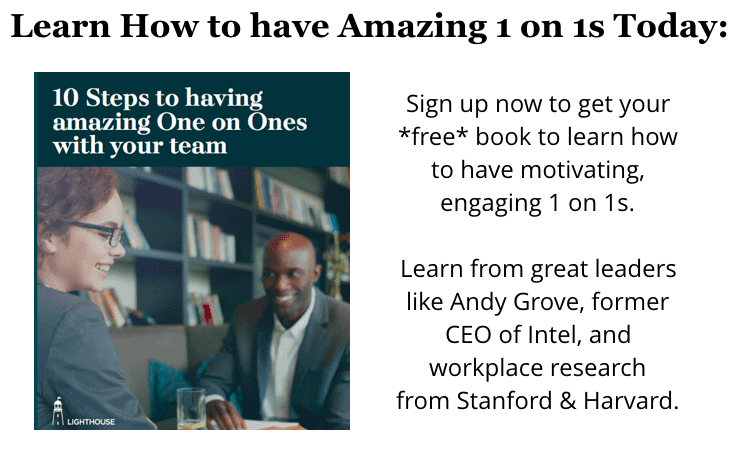 Ready to start having great one on one meetings with your team? There’s no time like the present to start learning what matters most to your team, fixing problems, and developing your people.